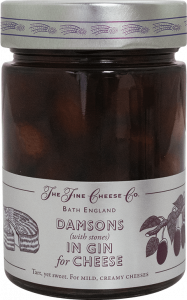 Another unique concept, with whole damsons (with stones) macerated in gin, to create a condiment that is at once tart yet sweet, with a delightfully boozy flavour and aroma. We were surprised at how well the damsons combined with our mild, creamy cheeses like Wigmore, Vacherin Mont d’Or or Brillat Savarin. Florian also enjoys throwing a few of the damsons into his favourite gin and tonic, along with a spoonful of the juice. Wow!